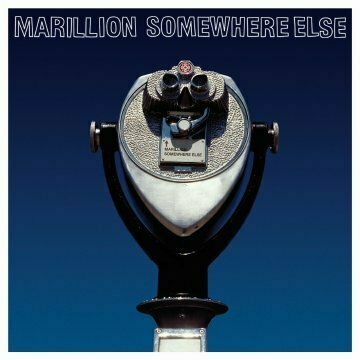 In 2004, Marillion released one of their strongest albums in years with Marbles. The album relied more on atmosphere and was rather mellow in comparison to its predecessor Anoraknophobia. In 2007, they bring us Somewhere Else, which stylistically is somewhere in the middle of the rockiness of Anoraknophobia and the relaxing atmospheres of Marbles. It can be said quite easily that this isn't the Marillion of old trying to rehash old ideas and call it an album. No, this album is quite different from its previous albums and shows the band going into a different direction musically. This album focuses more on songwriting and melodies rather than creating long pieces and trying to be considered "progressive" (a term that the band tries to steer clear of, despite their obvious affiliation to the term). In the end, this collection of songs is filled with catchy hooks, opinionated and meaningful lyrics, and a general focus that drives the album along through its 50 or so minutes of playing time. Songs like The Other Half and Most Toys are rocking pieces that really show how the band can write faster numbers (the first one is one of my favorites on the album and from first listen it really showed me that this album would be something enjoyable), while the middle pieces like Somewhere Else and Voice From the Past take the listener through more atmospheric and gentle atmospheres. H's vocals aren't as good as on previous albums, but he still manages to perform well even if his voice is showing aging (not unlike Fish, whose voice has completely changed over time). The album also takes a political stance with songs like The Last Century For Man, which has an oblique lyrical theme and a chorus that has sarcasm and sincerity all in one fell swoop. The concluding piece to the album, Faith, has been played by the band for many years prior to the release of this album, and it's gentle acoustics and fragile vocal performance from Hogarth really act as a fitting conclusion to the album. Musically, the band is more focused on songwriting than soloing at this point. Rothery still cuts loose on a few key moments on the album, but his playing is more restrained and focused on creating stellar atmospheres (something he's always be quite proficient at). Mark Kelly also has a prominent role on this album, his quirky keyboards often compliment Rothery's guitar work quite well and add another impressionable element to the music. The rhythm unit of Mosley and Trewavas don't let up either, both offer well conceived and integral performances at just the right time. In all, instrumentally this album is a perfect example of a band working as a team in trying to create cohesive and melodic/catchy songs. In this department, Marillion rarely fails.